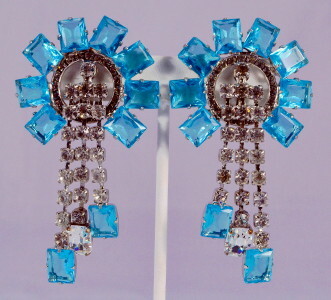 1960's vintage Kenneth J Lane earrings. Turquoise emerald cut crystals, clear rhinestones, rhodium plated base metal. Turquoise crystals & chanel set clear rhinestones in circular pattern over rhinestone drop extensions. Emerald cut stones at extension ends. Rhodium plated setting. Clip backs. Marked KENNETH LANE on setting back. Mid century era, true 1960's vintage. Excellent condition. Clear middle drop stone has been professionally replaced. Some rhinestones are lightly discolored. Priced accordingly.